Has Bibi Won the First Round? On two key issues of Barack Obama’s foreign policy -- Palestinian statehood and reconciliation with Iran -- Binyamin Netanyahu, Israel’s Prime Minister, has chosen to fight the American President. He has refused to bend to Obama’s will, and is instead seeking to outwit and defeat him. Thus, to save his right-wing coalition -- and his own job -- Netanyahu has not hesitated to offend Obama and even put at risk Israel’s vital relationship with the United States. The fact that he has done so suggests that he thinks he can win the present battle of wills. Indeed, Netanyahu may already have won the first round. The evidence is fragmentary, but seems to be there nevertheless. If a State Department spokesman is to be believed, the United States is softening somewhat its demand for a total Israeli settlement freeze before Israeli-Palestinian negotiations can begin. Washington also seems to have embraced Israeli demands for tougher sanctions against Iran, if it refuses to halt uranium enrichment by a September deadline. Obama had earlier mentioned September as a tentative date when the situation would have to be reassessed. These apparent concessions to Israeli demands may be only tactical. In squeezing Netanyahu, Obama has proceeded with great caution. The American president has not yet revealed his own battle plan. It is as if he has wanted the Israelis to reach certain conclusions by themselves, rather than be pushed. To Netanyahu’s way of thinking, however, it is Obama who is beleaguered -- not himself. After all, from Netanyahu’s standpoint, Obama has committed the cardinal sin of daring to equate Israeli and Palestinian interests, and of reaching out a hand of friendship to Iran, a country Israel has long identified as a dangerous rival. Netanyahu wants Iran struck down, much as Israel and its friends pressed the United States to strike down Saddam Hussein’s Iraq for seeming to pose a long-term strategic threat to the Jewish state. It is now clear that Netanyahu has no intention whatsoever of ending the occupation and settlement of the West Bank, or of conceding Palestinian statehood in any meaningful sense. Regarding Iran, he has spared no effort to press the international community to punish Iran with paralysing sanctions, while hinting that Israel would itself strike Iran, with or without America’s green light, if Tehran did not put an end to its nuclear programme. These are arrogant and short-sighted positions. They point to a lack of fresh security thinking in Israel. It is as if Netanyahu and his civilian and military colleagues were blind to the evolution of international (including American) opinion regarding Israel, and to the looming changes in Israel’s strategic environment. Indeed, it is as if Israeli leaders remained persuaded that harsh and brutal methods -- the continued seizure and settlement of Palestinian land, the repeated assaults on Israel’s neighbours, the political assassination of Arab opponents -- would continue to work in the future as they have done in the past. In other words, that Israel would always be able to dominate the entire region militarily, and would therefore have no need to make concessions. Netanyahu was in Europe this past week. After meeting Britain’s Gordon Brown and Germany’s Angela Merkel, he declared that no settlement freeze had been agreed; and that he would certainly not accept a freeze in East Jerusalem, where building has, in fact, been speeded up. Meanwhile Foreign Minister Avigdor Lieberman has warned Palestinian Prime Minister Salam Fayad that Israel would not tolerate him declaring a de facto Palestinian state by 2011, if negotiations had not progressed by then. Netanyahu may indeed have boxed himself into a corner, lulled by the fact that Obama has not yet published his peace plan. There is talk of a tripartite meeting between Obama, Netanyahu and Mahmud Abbas, president of the Palestinian Authority, in New York at the end of September. Obama might have added that Israel’s land grab must not only be stopped, but put into reverse. For the conflict to be resolved, settlements will have to be evacuated; borders defined; Jerusalem shared; and a solution agreed for the refugees. To focus on Israel’s security alone, as Netanyahu evidently prefers, would be to elude and fudge other key problems which will need to be addressed. Netanyahu will need to be persuaded that it is dangerous for him to subvert the central planks of Obama’s Middle East policy; dangerous to take on a regional power such as Iran, with its prickly nationalism, ancient civilization, a population ten times that of Israel, and a land area vastly bigger; dangerous to reject the 2002 Arab Peace Initiative, which is still on the table (but for how long? ); dangerous to keep building in Arab East Jerusalem; dangerous to seek to destroy Hamas by the pitiless siege of Gaza; dangerous to delay liberating Gilad Shalit by a prisoner exchange; above all, dangerous to keep on piling up hate against Israel by a callous indifference to Arab interests and to Arab life. However difficult it may seem, the time for a settlement of the Arab-Israeli conflict has arrived. Barack Obama is the one world leader -- indeed the only one in our lifetime -- who has a chance of pulling it off. He knows that it holds the key to America’s future relations with the Arab and Muslim world, and that it is the only way to exorcise the curse of terrorism, which is spreading like an epidemic. A comprehensive Arab-Israeli peace would stabilise the region, introduce a new era of prosperity, guarantee Israel’s long-term security, bring Iran into the circle of friendly nations, and even allow Washington, with the enhanced authority of a successful peace-maker, to bring an honourable end to its costly and misguided war in Afghanistan. Netanyahu may have won an early round against Barack Obama, but he has by no means won the war. We have seen only skirmishes so far. The real battle is yet to come. A Palestinian youth, 15, has been shot dead by Israeli forces in an incident outside a settlement near the West Bank town of Ramallah. The Israeli military said Muhammad Riad Nayef was among a group of youths that troops fired on after they hurled firebombs at a guard post. But Palestinian police quoted witnesses who said stones and firebombs were only thrown after the boy was shot. The incident comes amid moves to restart peace talks later this months. The wounded teenager was transferred to an Israeli hospital in Jerusalem, where he later died. Palestinian medical sources said another four people, three youths and one ambulance driver, were injured in the incident at the Jalazun refugee camp, near the settlement of Beit El. The death comes as the US is pushing to restart Israeli-Palestinian peace talks. Israel's largely ceremonial president, Shimon Peres, said on Monday that US President Barack Obama may chair a proposed meeting between the Israeli and Palestinian leaders in September. Israeli Prime Minister Benjamin Netanyahu and Palestinian Authority President Mahmoud Abbas may meet on the sidelines of the UN General Assembly in New York in late September, Mr Peres told Fox News. The EU's foreign policy chief Javier Solana said he expected "some kind of statement, some kind of proposal" on fresh negotiations around that time. The US and Israel have been trying to reach agreement over Palestinian demands for a complete halt to building in settlements in the occupied West Bank, before they will restart peace talks. Israel wants to keep building to allow what it calls the "natural growth" of settler communities, and has refused to stop building in East Jerusalem. But Nabil Shaath, a former Palestinian prime minister and a senior member of Mr Abbas's Fatah movement, said the Palestinians would reject calls to negotiate if Israel only implemented a limited freeze. "I would say, Mr Obama, we love you... but I am sorry this is not enough to bring us to the peace process." He said a freeze must include all of the West Bank and East Jerusalem, and must last until a final peace agreement was reached. At least 450,000 Israeli settlers live in the West Bank, including East Jerusalem. A report by the former auditor of Bear Mountain Resort (a massive golf, hotel and commercial and residential project near Victoria headed by Canadian Len Barrie) has accused the Tampa Bay Lightning co-owner and other senior members of the complex's management team of misappropriating funds. The Victoria accounting firm of Norgaard Neale Camden Ltd. made the report to Bear Mountain?s executive committee last January and then resigned as the auditor on April 15 because it felt some financial transactions were illegal and because Bear Mountain's directors did not take action. Some of those transactions, according to the report, involved at least $2.5-million that Mr. Barrie, a former NHL-player-turned-owner, used to pay for his part of the Tampa Bay Lightning. The report raised questions about more than $25.8-million paid to Mr. Barrie or companies under his control going back at least two years by the partnership that owns Bear Mountain. "We brought to your attention a number of instances where senior members of [Bear Mountain] management had engaged in a number of activities that, in our view, were improper and, in some cases, illegal," the auditor stated in its resignation letter, which was signed by Allan Neale, a partner in Norgaard Neale Camden. That is an engulfing story, Delores. Thanks for posting it. No fault to find with anyone in those extreme circumstances - exhausted, in a 100 degree hospital without power or water or virtually any necessary resources, left to fend for themselves in a dreadful situation, and well-intentioned to the end, the actions of all of them seem heroic. The extraordinary behaviour of these people, shines through the awfulness. Until the attorney-general opened investigations 14 days after Katrina. Then it gets ugly, as lawyers and medical investigators start trying to uncover evidence, performing autopsies on rotting corpses. I followed the link to the two YouTube videos of Sheri Fink talking about the story. In the second part, starting at about 3:27 she is asked about the details she amassed in her research and interviews and what was left in and what was left out in the final edit. Her response to the question made me smile and feel right at home. U.S. author, dissident intellectual, and Professor of Linguistics at the Massachussetts Institute of Technology Noam Chomsky met for the first time with Venezuelan President Hugo Chavez in Caracas and analyzed hemispheric politics during a nationally televised forum on Monday. Survival: America's Quest for Global Dominance. "Hegemony or survival; we opt for survival," said Chavez in a press conference to welcome Chomsky. He compared Chomsky's thesis to that of German socialist Rosa Luxemburg in the early 1900s, "Socialism or Barbarism," and referred to Chomsky as "one of the greatest defenders of peace, one of the greatest pioneers of a better world." Through an interpreter, Chomsky responded, "I write about peace and criticize the barriers to peace; that's easy. What's harder is to create a better world... and what's so exciting about at last visiting Venezuela is that I can see how a better world is being created." During Monday's forum, which was broadcast on the state television station VTV, Chomsky pointed out that the ongoing coup in Honduras, which began on June 28th, is the third coup the United States has supported in Latin America so far this century, following the coup against Chavez in 2002 and Haitian President Jean-Bertrand Aristide in 2004. The nearly finalized deal to allow the U.S. to increase its military presence on Colombian bases "is only part of a much broader effort to restore Washington's capacity for intervention," said Chomsky. According to Chomsky, the region has the capacity to unite and form a "peace zone" in which foreign militaries are forbidden to operate. "Venezuela can help to advance this proposal, but it cannot do it alone," he said. "The transformations that Venezuela is making toward the creation of another socio-economic model could have a global impact if these projects are successfully carried out," said the renowned author. 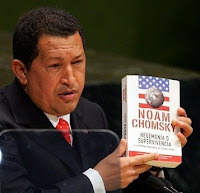 Aporrea.org, a popular Venezuelan news and pro-revolution analysis website, described Chomsky as oriented toward "libertarian socialism" and "vehemently anti-Stalinist" in an introduction to a recent interview in which Chomsky said U.S. President Barack Obama's foreign policy will be similar to that of the second administration of former U.S. President George W. Bush. Chomsky addressed this issue during Monday's conference as well, commenting that Obama "could have much to offer Latin America if he wanted to, but hasn't given any signals that he does." He cited the U.S.'s indecisive posture toward the coup in Honduras as evidence. Chomsky also addressed the media and freedom of expression in the U.S.
"In the United States the socio-economic system is designed so that the control over the media is in the hands of a minority who own large corporations... and the result is that the financial interests of those groups are always behind the so-called freedom of expression," he said. Chomsky said the growing disappointment with the Obama administration in the U.S. was predictable because the corporate media marketed Obama's presidential candidacy on the slogan of "Change We Can Believe In" but omitted concrete proposals for effective changes, and the Obama administration has since shown an incapacity to institute such changes. James Suggett is a Melman Fellow at the Institute for Policy Studies and a writer for venezuelanalysis.com. Companies from US, UK and Australia have the most concentrated financial power. WASHINGTON -- A recent analysis of the 2007 financial markets of 48 countries has revealed that the world's finances are in the hands of just a few mutual funds, banks, and corporations. This is the first clear picture of the global concentration of financial power, and point out the worldwide financial system's vulnerability as it stood on the brink of the current economic crisis. The most pared-down backbones exist in Anglo-Saxon countries, including the U.S., Australia, and the U.K. Paradoxically; these same countries are considered by economists to have the most widely-held stocks in the world, with ownership of companies tending to be spread out among many investors. But while each American company may link to many owners, Glattfelder and Battiston's analysis found that the owners varied little from stock to stock, meaning that comparatively few hands are holding the reins of the entire market. Matthew Jackson, an economist from Stanford University in Calif. who studies social and economic networks, said that Glattfelder and Battiston's approach could be used to answer more pointed questions about corporate control and how companies interact. "It's clear, looking at financial contagion and recent crises, that understanding interrelations between companies and holdings is very important in the future,” he said. "Certainly people have some understanding of how large some of these financial institutions in the world are, there's some feeling of how intertwined they are, but there's a big difference between having an impression and actually having ... more explicit numbers to put behind it." Based on their analysis, Glattfelder and Battiston identified the ten investment entities who are “big fish” in the most countries. The biggest fish was the Capital Group Companies, with major stakes in 36 of the 48 countries studied. In identifying these major players, the physicists accounted for secondary ownership -- owning stock in companies who then owned stock in another company -- in an attempt to quantify the potential control a given agent might have in a market. The results raise questions of where and when a company could choose to exert this influence, but Glattfelder and Battiston are reluctant to speculate. "In this kind of science, complex systems, you're not aiming at making predictions [like] ... where the tennis ball will be at given place in given time," Battiston said. “What you're trying to estimate is … the potential influence that [an investor] has." Glattfelder added that the internationalism of these powerful companies makes it difficult to gauge their economic influence. "[With] new company structures which are so big and spanning the globe, it's hard to see what they're up to and what they're doing,” he said. Large, sparse networks dominated by a few major companies could also be more vulnerable, he said. "In network speak, if those nodes fail, that has a big effect on the network."